By Sebastian H. Brousseau, LLB, BSc. Documents of all types are a fact of our lives. Licenses, permits, certificates, and a whole slew of other papers are needed for nearly anything these days. These documents are necessary in order to do the things people want to do. There are some very specific documents that are not legally recognized between different countries. These would be marriage, divorce, birth, and death certificates are not legally recognized, and in order for these documents to be considered valid across international boundaries they must be LEGALIZED. To LEGALIZE is NOT the same as to NOTARIZE but similar. For notarization, click this text on Thai notaries. In Thailand the process of legalization for marriage, divorce, birth, and death certificates is quite straightforward when done properly. Any failure to comply with all that the government of Thailand requires results in needless headaches and wasted time. To avoid that, here is presented the step by step procedure for document legalization in The Kingdom Of Thailand. First, and always the most important, HAVE THE ORIGINAL DOCUMENT. Nothing can be done without an original document. Whatever document it may be, the original is taken to the embassy of its orginal. If it is a Canadian marriage, it has to go at the Canadian embassy. If it is a Dutch birth certificate, it has to go to the Netherlands embassy. In there, the embassy they will produce a copy which will bear a stamp of the embassy stating that it is a “CERTIFIED TRUE COPY OF THE ORIGINAL”. This stamp must include the date, a signature from a senior official at the embassy, and the official stamp of the embassy. This first step can be done using the Power of Attorney for some countries, but not all. For instance, a Canadian can send his passport to the Canadian embassy through a third party with a power of attorney to make a certified true copy of an original. But the American embassy in Bangkok does not allow it and the holder of the passport must go himself or herself at the embassy. It is important that anyone wishing to use Power of Attorney to obtain a Certified True Copy must first contact their embassy to verify if this is permissible or not. After the embassy has produced a copy as certified true, and it includes all the stamps and signatures, the second step is get the certified true copy translated into Thai. There are many businesses offering translation services for these exact situations. The newly translated document of the Certified True Copy must bear a stamp stating that the document is a CERTIFIED CORRECT TRANSLATION along with a signature. One important thing to remember is that Thailand only deals with documents in Thai or English. Therefore, IF THE ORGINAL DOCUMENT TO BE LEGALIZED IS NOT IN ENGLISH IT MUST BE TRANSLATED INTO ENGLISH AS WELL AS THAI. Should there be a situation of urgency and translation needs to be done as soon as possible, Thailand’s Ministry of Foreign Affairs has person waiting there to complete rush translations just outside their offices. Now with the Certified True Copy of the original document and the Certified Correct Translation document it is time to head to Thailand’s Ministry of Foreign Affairs. This is the address of the MFA for legalization, in Chang Wattana, not far from immigration offices of Bangkok. Inside the Ministry of Foreign Affairs both the Certified true copy from the embassy and the certified true translation copy are submitted to an officer for approval. The standard price to legalize a document at the Ministry of Foreign Affairs is 200 baht per document. There is also an express service which is double the price when documents need to be legalized before noon. Once an officer has reviewed the docents and found everything to be in order their will stamp both documents on the back-side of the page. 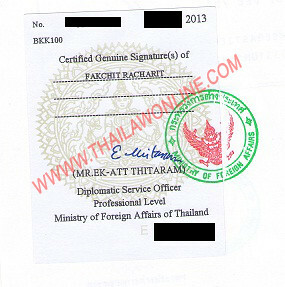 On the certified true copy, this stamp MUST be in English and on the certified correct translation it MUST be in Thai. As well as having been signed by an official at the ministry and the Official Stamp for the Seal of Thailand’s Ministry of Foreign Affairs. This document is Legalized by the Ministry of Foreign Affairs in Thailand. When both documents have the correct stamps and signatures from the Ministry of Foreign Affairs, and 200 baht has been paid for each page submitted, the process of legalization is complete and the document is thereby recognized as a legally binding document in The Kingdom of Thailand. This an example of Canadian passport translated and legalized. They will put the Thai translation in front of the certified true copy of your Embassy. In one upper corner, one stamp of the MFA will appear. 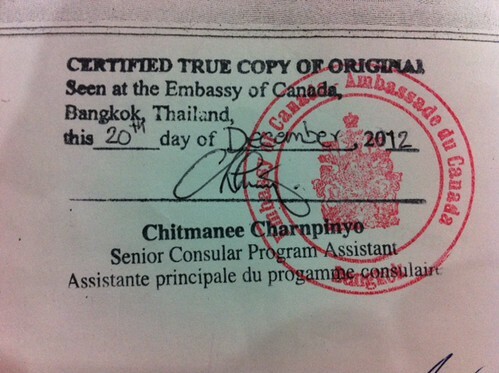 The Embassy stamp is completely translated in Thai and the translation is certified. 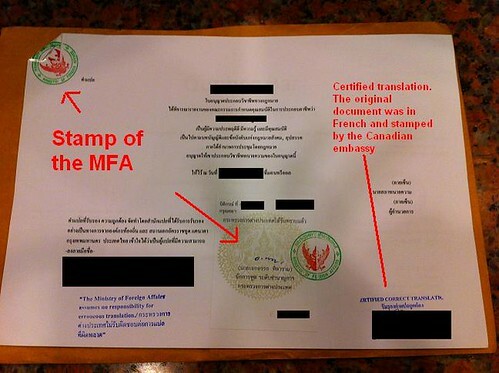 This is the famous stamp of the Ministry of Foreign Affairs in Thailand. It normally appears on the back of your document, but can also appear on the front.